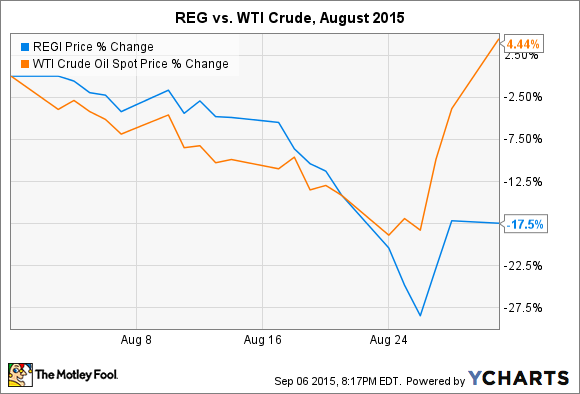 Can Renewable Energy Group Shares Recover From an 18% Fall in August? Shares of the nation's largest biodiesel producer got whacked last month after a difficult pricing environment took a turn for the worse. Will investors see more red in 2015? What: While Renewable Energy Group (NASDAQ:REGI), already the nation's largest biodiesel producer, acquired the nation's largest biodiesel facility from Imperium Renewables in August, not even the addition of 100 million gallons of annual production capacity could keep shares from sliding nearly 18% last month. It's easy to want to tie the stock's performance to falling petroleum prices -- which have slammed earnings in 2015 -- but oil prices actually increased a modest 4% last month. It appears that the market is impatiently reacting to the details of the deal, too. So what: In the long term, it will be difficult to label Renewable Energy Group's acquisition of Imperium Renewable's Grays Harbor facility in Washington state as anything other than a "steal." The facility has an annual output of 100 million gallons of biodiesel, is perfectly situated on the West Coast (the company's next closest facility is 1,600 miles further east), an area that brings higher selling prices, and is loaded with a storage terminal, ample rail transportation options, and the ability to service deepwater Panamax tankers. The up-front price? A cool $15 million in cash, 1.7 million shares, and the acquisition of $5.2 million in debt. A steal. However, in the near term, I can see why investors may be a little disappointed, especially given the strong headwinds facing fuels producers. That's because the acquisition also allows Imperium to receive up to $0.05 per gallon of biodiesel sold from Grays Harbor for two years, which could cost investors up to an additional $10 million in earnings over the period. Additionally, the facility will need to undergo maintenance and upgrades -- standard procedure for newly acquired REG facilities -- of at least $5 million. In other words, while Grays Harbor will result in volume growth and carry top- and bottom-line growth once operations begin under the Renewable Energy Group flag, the growth potential won't max out until per-gallon payments to Imperium stop in late 2017. Investors are thinking about that as they get slapped with the fact that year-over-year biodiesel selling prices were down 36% in the second quarter. Now what: It's rough for investors right now. Just as Renewable Energy Group stock built up momentum after gaining long-term certainty concerning federally mandated blending volumes, volatile petroleum prices arrived to knock shares back down. That said, the company still has amazing management and a spectacular balance sheet and continues to trade at nearly half of book value of $16.59 per share. In addition, the Grays Harbor acquisition will be a tremendous catalyst in the short and long term. If the company paid more up front and didn't agree to a per-gallon payment for the next two years, then would investors be as worried? I doubt it. Take the long view.